And as soon as he says the “b” word, my mind races into all sorts of directions. It’s instantaneous and automatic. But I mask the stuff going on inside of me and say that I think it’s a great idea. I’m proud of his initiative and thankful for opportunities for my youngest to put himself out there. But the “b” word? The concept of bullying? It’s a tough one for sure. Especially when it comes to this one. Maybe the stuff flying around my mind is heightened by the fact that it’s close to time when we came face to face with how life changing (and life-threatening) bullying can be. October 26th, 2012 to be exact. That was the day when…this one….suffered cardiac arrest at school. Estimates were that he had stopped breathing for at least 5 minutes. FIVE minutes of no oxygen to the brain. A series of amazing events and people revived him. But his body was seizing uncontrollably. Long story short, he was airlifted to Levine Children’s Hospital in Charlotte, NC, where he was placed in a polar suit which lowered his body temp considerably. He was in a coma for three days, ‘woke up’ on the third day, and the rest is history. So where does the bullying come in? And what caused the cardiac arrest? We didn’t realize that Tanner had a heart condition called CPVT. It’s a condition in which either physical exertion or emotional distress can trigger an arrhythmia which runs out of control and results in fainting, seizing, and possibly cardiac arrest. Yes, cardiac arrest in an otherwise healthy 13 year old boy. I will just say that what triggered the cardiac arrest that day wasn’t physical exertion. I wish it had been. It would’ve been much easier to handle that way. No, what caused Tanner’s body to ultimately shut down, was emotional distress….and the “b” word. Tanner’s path hasn’t been an easy one. Previous to him going to school I had only had two of my kids go to the principal’s office. One was an incident in a Christian K-4 class where my son lied about kissing a girl. (I repeat, K-4 year old class! ), and another was when my son pushed back another student when he was in 6th grade. But to protect the innocent and sometimes not so innocent, I will only say that school for Tanner had never been easy. Maturity levels and a stubborn streak along with some impulsivity invited ridicule from other students. And it came with a fury. 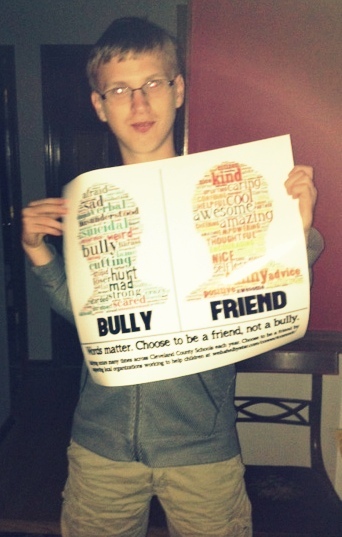 Tanner learned about bullying from both sides. From the side of being bullied, and later, from the side of bullying. He had started taking things into his own hands and fighting back in a way that didn’t help him. But in the beginning of 7th grade, he turned it around. He was encouraged by adults (strongly encouraged by adults including the principal) to not retaliate. To let the adults handle it. To not fight back. To take it. So, on the morning of October 26th, 2012 (and who knows how many other days) he did what he was told. He took it. When a student ruthlessly teased and provoked him in his class, he didn’t fight back. As the day wore on, the mean comments continued and he was getting more and more upset. The students in the class saw what was going on. Tanner, who by this point would most often fight back, chose not to. And while he was standing in line at the cafeteria, Tanner went down. He went down on the cafeteria floor and and stopped breathing. Imagine 7th grade students watching this play out…the relentless teasing, the stress that it places on all of them, and then watching Tanner just fall to the ground. As stated earlier, he was miraculously revived. God has been so good to us. But the heartache…literal and physical…was so much more than physiological not just for Tanner, but for the students who took it all in, and for those of us who absolutely adore this kid. There are many shades of bullying, and like dominoes falling, one thing can lead to another in terms of how students react not just to being bullied, bullying, but even in witnessing events. Tanner’s heart condition led him to have a severe reaction to bullying, but it reinforced the truth that it can take a mental, emotional, even physiological response. The emotional distress was too much and his heart went into overdrive and then stopped. Thankfully, the school went on lock-down and an incredible staff joined together to both revive Tanner, and also hurry the students away from witnessing more than what they had already seen as they administered CPR to an unresponsive child. But they had seen so much already. Bullying brings us all down on unimaginable levels. It hurts everyone. One of my favorite quotes is “Where courage is not, no other virtue can survive except by accident.” (Sam Johnson). Sometimes courage is silent and lets things roll. We need to teach our children to listen to the right voices. Matter of fact, we need to listen to the right voices. Sometimes courage goes to the line of battle and steps in to say or do the right thing. When we see someone being mistreated, courage discreetly steps in and protects the unprotected. Courage is strength to do the right thing no matter how difficult the circumstance. For adults as well as children. Plato’s words “Silence breeds consent” ring true. May we never turn a blind eye to people being mistreated. May we teach our children that strength is standing up for the weak even when it puts us in the place of scrutiny. So, when I look at the photo of this one with the poster that he was so excited about, designed with the help of his brother,and stood there holding with pride, I’m thankful and hopeful. Thankful for new beginnings. Thankful for growth. Hopeful for the way that we can live and learn and grow….when we’re children, and when we’re adults. Bullying is a huge issue in our schools, in our communities, in our world. The modes of communication like the internet and cell phones and social media make it so much easier to bully people. The toll it takes is often like a silent killer….little by little crushing the spirits of the victims and, on the flip side, changing the perpetrator for the worst. Bottom line, bullying kills. It robs and kills and destroys over time. It happens one word at a time. But,so does stopping it. So, when I look at these words that are on this one’s poster? I think I’ll focus on the right side, and be thankful for grace and lessons learned in my life and my children’s lives. Lessons may not be learned perfectly, but I’m thankful for the moments when I can see in such a visible way, that at least we’re moving in the right direction. And we’re all the better for it. And I hope our lessons learned will impact others. Tanner is teaching me. And I think a few of these posters are going to go up in my students’ rooms at my school. Love how lessons learned can be multiplied and made new. Yes, I’m thankful for a new October. So thankful.